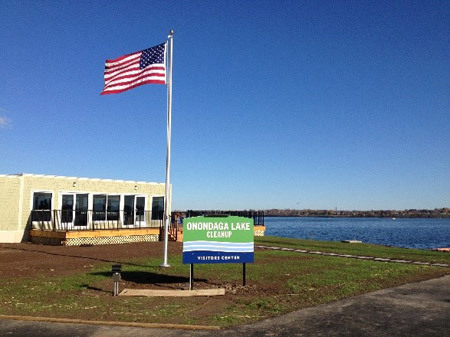 Open house sessions at the Onondaga Lake Visitors Center are being held on Fridays from 12 p.m. to 4:30 p.m. To date, more than 17,000 community members have toured the center and have learned about the lake cleanup firsthand. The Visitors Center is located along the southwest shoreline of Onondaga Lake in Geddes. It was designed and built by Honeywell to provide public access to the significant work that has taken place. From significant improvements in water quality to the return of native plants and animals, the Onondaga Lake Visitors Center allows community members to see the progress being made to restore the natural beauty and value of Onondaga Lake and adjacent habitats. The Visitors Center regularly hosts group tours, including school groups. To schedule a group tour, please call 315-552-9751 or submit this form. TO ACCESS THE VISITORS CENTER: From Points West: Take I-690 East to Exit 7, turn left onto State Fair Boulevard, take the first left passing under I-690, drive straight toward the lake and follow signs to the Onondaga Lake Visitors Center. From Points East: Take I-690 West to Exit 7, turn right at the off ramp and follow signs to the Onondaga Lake Visitors Center.